Anon. sale, Sotheby's, London, 28 June 1988, lot 23. J.M. Kyriazi, Van Dongen et le fauvisme, Lausanne, 1971, p. 145, no. 4 (illustrated in color, p. 23). A photocertificate from the Wildenstein Institute dated Paris, 21 June 1995 accompanies this painting. 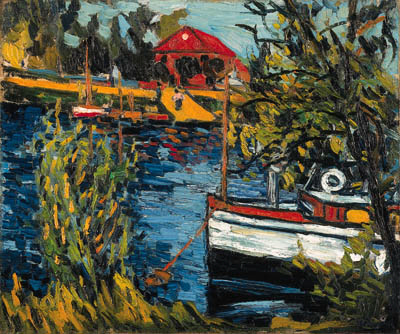 During the summer months of 1906, while his artist friends left to paint in coastal locations--Matisse to Collioure, Marquet and Dufy to Normandy, Derain to England and L'Estaque--Vlaminck stayed in the vicinity of the Seine, painting in Chatou, Bougival, Argenteuil and Le Pecq. The Seine at Chatou was divided into two channels, separated by a continuous band of narrow islands which ran for miles. As indicated by the present work, Vlaminck's paintings from this period, although stylistically radical, exude intimacy and convey a sense of harmony with the landscape. As a local resident painting familiar sites, he obviously loved the places he painted, with the affection of someone who is pleased to see the same places under old as well as new lights. "Whenever he recalled the motifs of the suburbs, he did so affectionately, and he reserved his most nostalgic expressions for Chatou and its familiar sights, sounds and routines" (J. Klein, "New Lessons from the School of Chatou: Derain and Vlaminck in the Paris Suburbs," in J. Freeman, ed., exh. cat., The Fauve Landscape: Matisse, Derain Braque and Their Circle, County Museum of Art, Los Angeles, 1990, p. 131).